I was recently contacted by Blackbird Digital Books to read and review a new digitally published novel, Diane Chandler’s The Road to Donetsk. I received a free digital copy of the book and no other compensation. All thoughts and opinions below are my own. In May 1994, fresh-faced 26-year-old Vanessa arrives in newly independent Ukraine from Manchester, England for her first international aid stint. From Kyiv (Chandler spells it Kiev, the Russian transliteration) Vanessa will oversee the implementation of a £3 billion program to help set up job centers and training to battle rising unemployment after the fall of the Soviet Union. One of the first non-Ukrainians that Vanessa meets in Kyiv is Dan, an American working for USAID in Ukraine. Before Vanessa is properly introduced, we find ourselves in a propellor plane with her and Dan, on a last-minute trip to Donetsk for a coal mine tour. (Donetsk and its people, we quickly sense, will become a central part of the novel’s narrative.) Vanessa is immediately attracted to Dan’s relaxed American charm, and it does not take long before a romance develops. However, for the first third of the book the romance feels forced and awkwardly dropped into the otherwise fascinating and insightful commentary on Ukraine in its early days of independence. Chandler vividly and accurately depicts Ukraine in its many guises: simple, sparkling yet laborious village life alongside grim and grimy underpaid miners; expat communities in Kyiv; vast steppe and birch forests; crumbling balconies and garish curtains; complex people who are hard to get to know. Chandler knows her stuff, having managed aid programs in Ukraine around the time she sets the novel. Vanessa’s story at times reads like Chandler’s memoir, so accurately and sensitively does the author portray Ukraine. This could not be a more timely book, highlighting Ukraine’s precarious position between Russia and Western Europe that has been the case for much of history. This position is particularly relevant since the Euromaidan demonstrations starting in 2013 that have led to Russia’s annexation of Crimea and part of eastern Ukraine. In the context of the novel, a Ukrainian tells Vanessa at one point that Ukraine stands “at the crossroads between East and West, we are the prize which you and Russia fight over. It is like a tug of war” (354). How times have not changed. As Vanessa struggles with her position as a western aid facilitator in a complicated country, her romance with Dan also develops its own complexities. The novel’s romantic elements start to feel less forced as Vanessa’s attraction to Dan develops a balance between Dan as a more experienced mentor in the aid world and Vanessa’s fresh, somewhat naive take on it. Recalling that this story is told as an older Vanessa’s memories, we start to sense that something may happen to doom the relationship. Will Ukraine get in the way? Overall, Chandler’s novel is insightful and enjoyable to read. There are some inconsistencies, such as when Ukraine’s Independence Day is stated as August 25th (it is actually the 24th). I also found some of the British slang stilted: Vanessa sits “keening silently”; why not just “weeping”? Despite these rough patches, The Road to Donetsk improves greatly after the first third and illuminates important and timely aspects of the aid world. Many PCVs begin their service with expectations like Vanessa’s; however, we soon learn that despite all the grants we write and trainings we lead, implementing something sustainable in a country with such a different history, culture, and mindset can be nearly impossible. But the people who do come into contact with a PCV or other aid program take away skills and experience, along with memories, into their futures. The exchange is mutual and it changes us for the better. 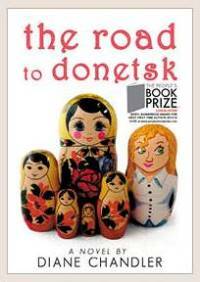 The Road to Donetsk has been named a Finalist for this year’s People’s Book Prize. You can purchase Diane Chandler’s novel from Amazon UK and Waterstones. Many thanks to Blackbird Digital Books for the opportunity to read and review this fascinating novel. This entry was posted in books/literature, community, culture, geography, history, Kyiv, language, literacy, Peace Corps, travel and tagged aid, Blackbird Books, Blackbird Digital Books, book review, Donetsk, Euromaidan, international development, London, novel, Peace Corps Volunteer, People's Book Prize, review, romance, Russia, UK, Ukraine, Ukrainian on 29.08.2015 by taplatt.